Billinudgel lies beside the Pacific Highway, just north of Byron Bay. It prides itself on its friendly, laidback, stress free, atmosphere. The pub in the little village was for many years famed for its publican, Ma Ring - Australia's oldest publican. The village was created around the railway siding in the late 19th and early 20th century. The original Hotel was near the site of the then Primary School. It was a shanty-type hotel with clientele including the local farmers, timber-getters and men working on the building of the Lismore to Murwillumbah railway line. When the railway line was completed in 1898, a new site was selected near the railway station for the hotel and thenew building was completed in 1898. The new hotel served travelers waiting for the train and locals delivering creamery cans and bananas for transport by rail. In early 1906 the new building burnt to the ground and the hotel didn’t reopen until early 1907. The hotel is still standing on the same site today. Mr Gerald O’Connor was the publican from then until around 1910. After Mr O’Connor left, the Hotel went through a succession of about twenty publicans in the space of twenty years. 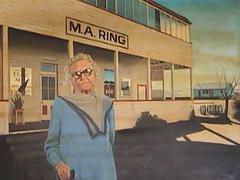 In 1929, New Zealand born Margaret Alice Ring ( Ma Ring ) took over as the licensee and remained in this position until her death in 1983, the oldest publican in Australia. The village is dominated by the pub - a big old Australian country hotel with a wide verandah, good food, beer and loads of character and charm. The Humble Pie complex attracts visitors for refreshments, and the industrial estate has various trade outlets of local craft industries. For nature lovers, there's Billinudgel Nature Reserve - a 375 hectare area 20 kilometres north of Byron Bay. The Reserve represents the last remaining coastal forest wetland of its kind. The reserve contains a number of archaeological sites including camp sites, middens, work areas and scarred trees.